Stuffed with cabbage, mushrooms or other healthy veggies, vegetable potstickers make a light, nutritious appetizer or side dish. 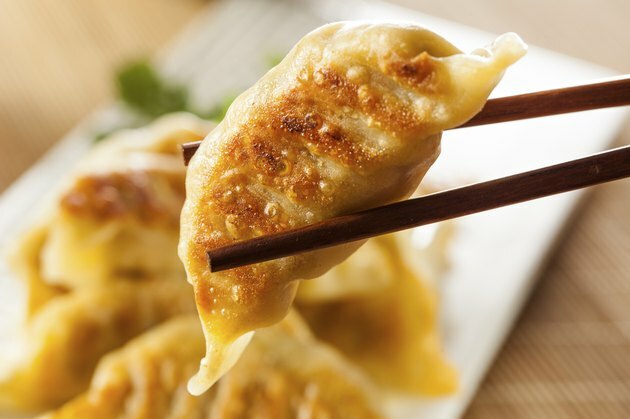 While these Asian dumplings already contain fewer calories than their pork-filled cousins, you can further reduce the calorie count by ordering your potstickers steamed rather than fried and by avoiding sugary dipping sauces. Calorie content varies by ingredients, but steamed vegetable potstickers served at restaurants average about 35 calories per piece. Fried in oil, they contain about 45 calories per piece. Depending on the recipe, you may be able to make a lighter potsticker at home. One version, made with vegetables and wonton skins and cooked in a skillet coated with cooking spray, contains just 25 calories per dumpling.